New economy businesses are deploying cloud-native services that are connected across hybrid and multi-cloud environments. Kong for multi-cloud is the fastest way for organizations to seamlessly adopt multiple cloud platforms. In this presentation, Senior Solutions Engineer, Aaron Miller, and Product Marketing Manager, Mike Bilodeau, will discuss using Kong for multi-cloud, the fully managed Kong Cloud offering and how Kong helps large organizations accelerate their digital transformation. - Learn about the advantages of deploying hybrid and multi-cloud architectures. - Understand how Kong Cloud works as a managed service. - Learn why Kong can make adopting microservices easier and more effective across hybrid and multi-cloud environments. Marco Palladino, Co-Founder & CTO, Kong Inc. & Aaron Miller, Senior Solutions Engineer, Kong Inc.
An overview of the emerging service mesh pattern and insights into what implementation of this architecture can look like for your organization. Service mesh is an emerging architecture design that allows organizations to control and measure service to service communications, also known as “east-west” traffic. This pattern is becoming ever more crucial for enterprises that have broken the monolith apart and moved towards microservices. In this presentation, Marco Palladino and Aaron Miller walk you through the history and evolution leading to the emergence of service mesh. An overview of the microservices evolution towards the service mesh pattern. A clear understanding of the benefits and caveats of this approach. Insights into the types of organizations that are most likely to benefit from implementing service mesh. Aaron Miller, Senior Solutions Engineer at Kong, and Cooper Marcus, Director of Ecosystem at Kong, share their insights into the Kubernetes ecosystem and discuss how this open source project is modernizing the microservices architecture. Container orchestration allows developers to better track, schedule and operationalize various containers at scale. If you want to run multiple containers across multiple servers and virtual machines — which you’ll need to do if you’re using microservices — this would require substantial DevOps resources to make a reality. As recent survey data from The New Stack suggests that container adoption is the most significant catalyst of orchestration adoption. In fact, 60 percent of respondents who’ve deployed containers broadly in production report that they are also relying on Kubernetes widely in production to assist with orchestration. Containers are quickly enveloping the world of software development. And the momentum behind Kubernetes as the future of infrastructure is not slowing down any time soon. 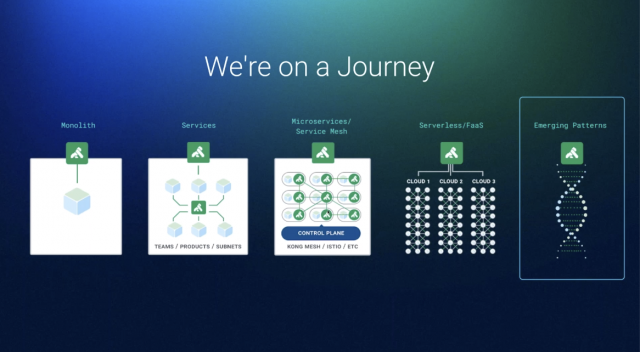 In this presentation Bhadri Govindarajan, Principal Application Engineer at Expedia, and Aaron Miller, Senior Solutions Engineer at Kong, go over some of the serverless use cases currently in production and in planning at Expedia. This presentation explores real-life use cases that bridge the gap between serverless excitement and serverless reality. Serverless could become the dominant application development model, lowering operations burden, increasing feature release velocity, and allowing developers to focus on delivering business value rather than worrying about deployment concerns and traffic planning. If fully adopted, serverless could have a massive impact in the infrastructure and the business models of the travel and retail industries as there will no longer be a need to forecast, plan, and provision for spikey workloads or unpredictable compute capacity. This presentation also includes an overview of Kong’s implementation at Expedia. Almost four years ago, McAfee embarked in the transition towards microservices. They needed an API platform that could integrate with a very complex infrastructure built using multiple languages and methodologies. Additionally, they required this solution to be able to scale or contract with services, and the team to be able to integrate and build custom capabilities on top of it. Kong is now a critical element of McAfee’s infrastructure, enabling its microservices journey and supporting it as it becomes the largest cyber security solutions provider across the globe. During its journey, the team at McAfee identified three challenges that are common to microservices architectures. Marcelo da Cruz Pinto, Principal Engineer at McAfee, shares the strategies he implemented to manage and minimize these challenges. Join Marcelo, and Paul Dickens, Principal Product Manager at Kong while they discuss McAfee’s journey and strategies to manage the challenges that arise with microservices architectures. With Kong 1.0, we confirm that Kong is a proven, robust, stable, and production-ready API management platform. Kong stands poised as an API gateway, service mesh, and the basis for a control platform that will serve users faithfully as their information exchange needs, and those of the industry, change. As the amount of data and services explodes, enterprises must prepare for a cloud-native world that enables them to free and scale their architectures. In this presentation, Kong CTO & Co-Founder, Marco Palladino, and Director of Ecosystem, Cooper Marcus, walk us through the journey towards Kong 1.0 and share the vision that positions Kong as a service control platform for all of your data flows, regardless of your chosen architecture or deployment patterns. - Gain visibility into the future of APIs and the implications for your architecture – Cloud-Native First, but hybrid while you get there. - Why you need a solution that can support all of your deployment patterns. In a short period of time, service APIs went from being primarily an edge interface connecting developers outside of the organization with internal systems to the glue that binds those internal systems (microservices) into a functioning whole. Consequently, one of the unavoidable results of microservice-oriented architectures is that internal communication within the data center will increase. Service mesh arose as a potential solution to the challenges that arise from increased East-West traffic by providing a different framework for deploying existing technology. However, most of what service mesh introduces has been provided for many years by API Management products. Features such as observability, network error handling, health-checks, etc. are hallmarks of API management. These features don’t constitute anything novel in themselves, but as a pattern, service mesh introduces a new way of deploying those features within our architecture. Join Kong CTO and Co-Founder Marco Palladino as he walks attendees through the architectural changes that have led to the rise of service mesh and why legacy API management solutions born before the advent of containers can’t keep up. Aaron Miller, Senior Solutions Engineer, Kong Inc.; Cooper Marcus, Principal Product Manager, Kong Inc.
Transitioning to a microservices architecture? As microservices become an evermore mission-critical component of your enterprise architecture, there are a few challenges that will become increasingly salient. The need for scalability, high performance, and flexibility will make you think about APIs differently. In this webinar, Aaron Miller and Cooper Marcus discuss the peculiar challenges of microservices architectures. They also demonstrate how Kong meets these challenges by being lightweight, super fast, and infrastructure agnostic. Learn about modern architectures and patterns including Microservices, service mesh, digital transformation, and multi-cloud.